From left are Misun Lee, Eunju Nam, Professor Mi Hee Lim of Natural Science, and Juhye Kang. 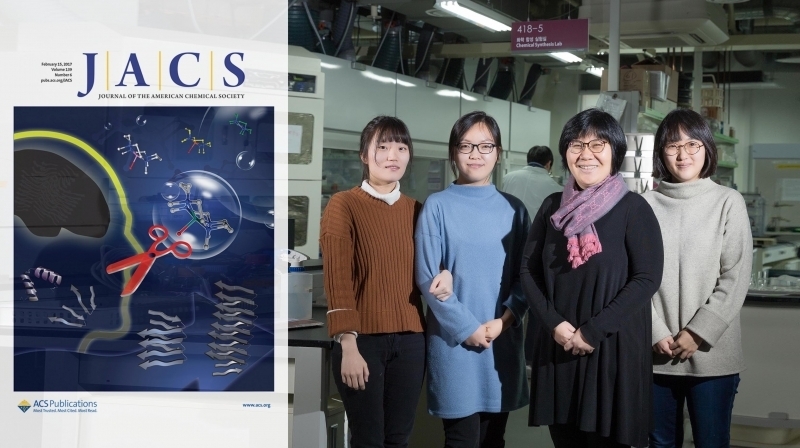 Their work has been selected to appear on the cover of the January 2017 issue of JACS. Their work has been selected to appear on the cover of the January 2017 issue of JACS, as well as as a JACS Spotlight article. Alzheimer’s disease (AD) is one of the most common form of dementia. 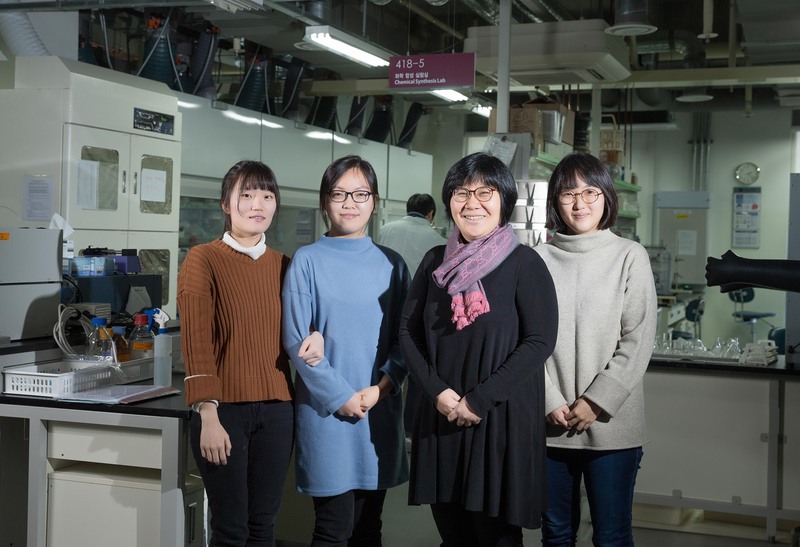 In search for new drugs for AD, the research team, led by Professor Mi Hee Lim of Natural Science at UNIST has developed a metal-based substance that works like a pair of genetic scissors to cut out amyloid-β (Aβ), the hallmark protein of AD. The study has been featured on the cover of the January 2017 issue of the Journal of the American Chemical Society (JACS) and has been also selected as a JACS Spotlight article. Alzheimer’s disease is the sixth leading cause of death among in older adults. The exact causes of Alzheimer’s disease are still unknown, but several factors are presumed to be causative agents. Among these, the aggregation of amyloid-β peptide (Aβ) has been implicated as a contributor to the formation of neuritic plaques, which are pathological hallmarks of Alzheimer’s disease (AD). 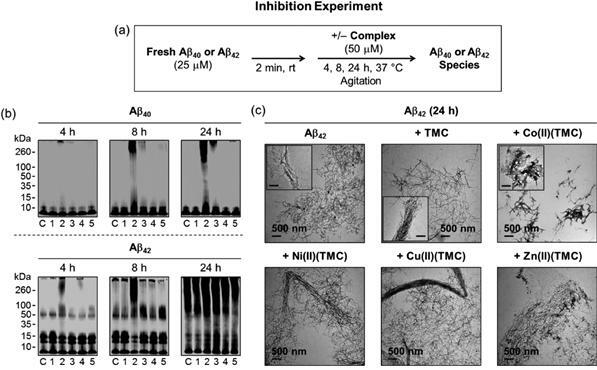 As therapeutics for AD, Professor Lim suggested a strategy that uses matal-based complexes for reducing the toxicity of the amyloid beta (Aβ). 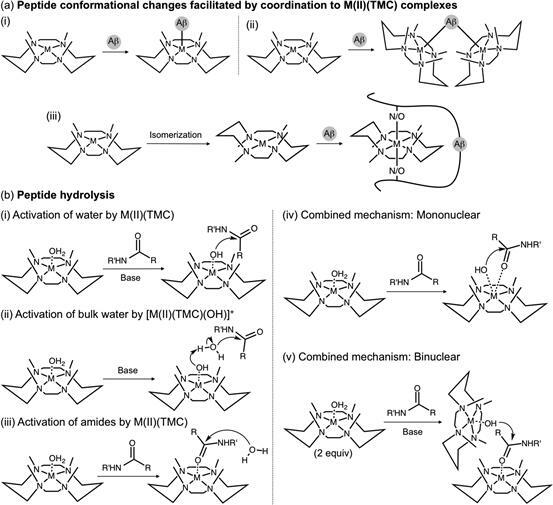 Althought various metal complexs have been suggested as therapeutics for AD, none of them work effectively in vivo. The research team has found that they can hydrolyze amyloid-beta proteins using a crystal structure, called tetra-N methylated cyclam (TMC). Hydrolysis is the process that uses water molecules to split other molecules apart. The metal-mediated TMC structure uses the external water and cut off the binding of amyloid-beta protein effectively. In this study, the following four metals (cobalt, nickel, copper and zinc) were placed at the center of the TMC structure. When the double-layered cobalt was added to the center, the hydrolysis activity was at the highest. 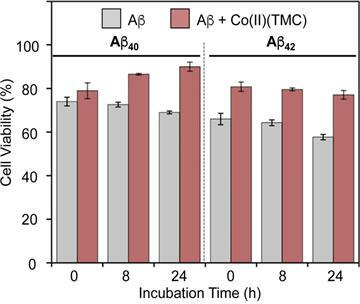 The research team reported that the cobalt-based metal complex (Co(II)(TMC)) had the potential to penetrate the blood brain barrier and the hydrolysis activity for nonamyloid protein was low. Moreover, the effects of this substance on the toxicity of amyloid-beta protein were also observed in living cell experiments. “This material has a high therapeutic potential in the treatment of Alzheimer’s disease as it can penetrate the brain-vascular barrier and directly interact with the amyloid-beta protein in the brain,” says Professor Lim. 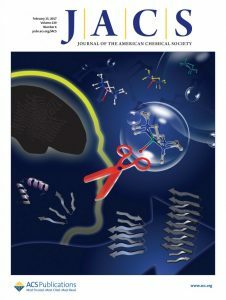 Professor Lim’s work has been selected to appear on the cover of the January 2017 issue of JACS. This study has also attracted attention by the editor of the Journal of the American Chemical Society. “Not only do they develop new materials, but they have been able to propose details of the working principles and experiments that support them,” according to the editor. This study has been conducted in collaboration with Professor Jaeheung Cho of Daegu Gyeongbuk Institute of Science and Technology (DGIST), Professor Kiyoung Park of Korea Advanced Institute of Science and Technology (KAIST), and Dr. Sun Hee Kim of Korea Basic Science Institute (KBSI). It has been also supporte by the National Research Foundation of Korea (NRF) and the Ministry of Science, ICT and Future Planning (MSIP). Jeffrey S. Derrick et al., “Mechanistic Insights into Tunable Metal-Mediated Hydrolysis of Amyloid-β Peptides”, JACS, (2017).